Naturally occurring pigments such as ochres and iron oxides have been used as colorants since prehistoric times. Archaeologists have uncovered evidence that early humans used paint for aesthetic purposes such as body decoration. Pigments and paint grinding equipment believed to be between 350,000 and 400,000 years old have been reported in a cave at Twin Rivers, near Lusaka, Zambia. Before the Industrial Revolution, the range of color available for art and decorative uses was technically limited. Most of the pigments in use were earth and mineral pigments, or pigments of biological origin. Pigments from unusual sources such as botanical materials, animal waste, insects, and mollusks were harvested and traded over long distances. 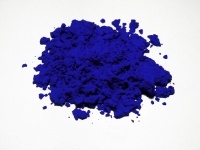 Some colors were costly or impossible to mix with the range of pigments that were available. Blue and purple came to be associated with royalty because of their expense. Spain's conquest of a New World empire in the 16th century introduced new pigments and colors to peoples on both sides of the Atlantic. Carmine, a dye and pigment derived from a parasitic insect found in Central and South America, attained great status and value in Europe. Produced from harvested, dried, and crushed cochineal insects, carmine could be, and still is, used in fabric dye, food dye, body paint, or in its solid lake form, almost any kind of paint or cosmetic. The earliest known pigments were natural minerals. Natural iron oxides give a range of colors and are found in many Paleolithic and Neolithic cave paintings. Two examples include Red Ochre, anhydrous Fe2O3, and the hydrated Yellow Ochre (Fe2O3.H2O). In The Milkmaid by Johannes Vermeer (c. 1658). Vermeer was lavish in his choice of expensive pigments, including Indian Yellow, lapis lazuli, and Carmine, as shown in this vibrant painting. Indian Yellow was once produced by collecting the urine of cattle that had been fed only mango leaves. Dutch and Flemish painters of the 17th and 18th centuries favored it for its luminescent qualities, and often used it to represent sunlight. In the novel Girl with a Pearl Earring, Vermeer's patron remarks that Vermeer used "cow piss" to paint his wife. Since mango leaves are nutritionally inadequate for cattle, the practice of harvesting Indian Yellow was eventually declared to be inhumane. Modern hues of Indian Yellow are made from synthetic pigments. Unless indicated otherwise, the text in this article is either based on Wikipedia article "Pigment" or another language Wikipedia page thereof used under the terms of the GNU Free Documentation License; or on original research by Jahsonic and friends. See Art and Popular Culture's copyright notice. This page was last modified 09:42, 2 January 2015.